Parks Lee Hay was born in Dallas, Paulding County, Georgia, on 16 July 1873, the son of Henry Wooten Hay (1837-1921) and Frances Caldwell (1843-1896). Both the Hays and the Caldwells had moved to the eastern Georgia piedmont before the War of 1812, the Caldwells from South Carolina and the Hays from Virginia. In the 1830s, the Hays moved to Meriwether County in west central Georgia, which is where Henry was born. In the 1850s, Henry's father, James Peyton Hay (1811-1885), a blacksmith, and grandfather Howell Hay (1785-1860) moved the family to Carroll County, Georgia, a few dozen miles northwest of Meriwether County. Henry Hay is thought to have lost a leg in the Civil War, but his military career has not been documented. He married Frances Caldwell around 1865 and apparently lived first near her father in Griffin, Spalding County, Georgia, where their first three children were born: John Morgan in 1866, James Willis in 1868, and Freeman A. in 1870. It is believed that they were in Dallas, Palding County, Georgia, by the time their fourth son, Parks Lee Hay, was born in 1873. A fifth son, Linton S., was born in 1875. Figure 1. 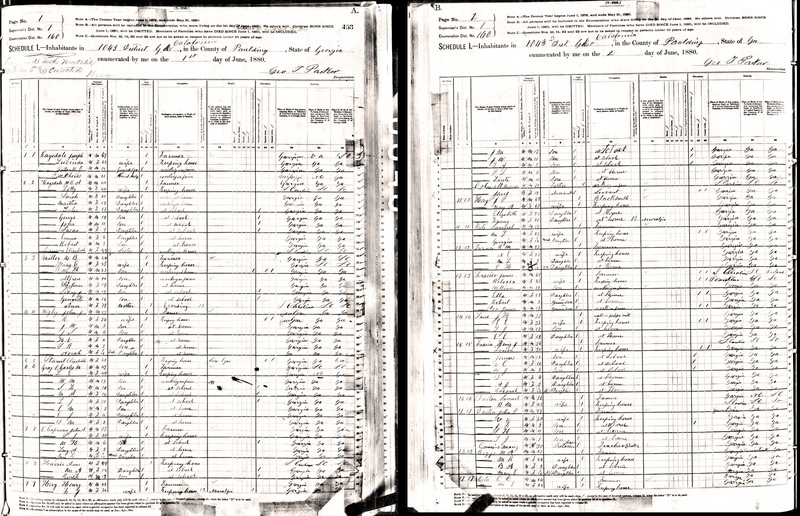 Federal Census schedule, 1880, showing six-year-old Parks Hay and his family, which included his maternal grandfather, Buford Caldwell. 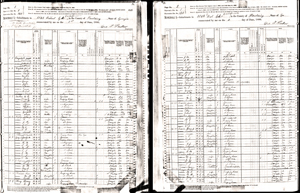 Parks' paternal grandparents, who were living nearby, are on the same census schedule. Parks Lee Hay was educated in the schools of Paulding County but only through the fourth or fifth grade, and his youth was spent mainly in working the family farm with his father and brothers. In 1893, Hay left the farm and went to Charleston, South Carolina. 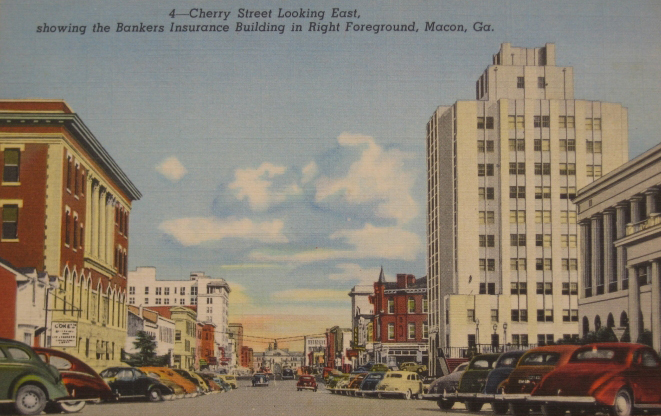 For eleven months, he worked as a collection agent for an old acquaintance of his father, but dissatisfied with his prospects there, he moved to Macon in 1894. In the midst of an economic depression, he was unable to find work and was forced to return home to Dallas—"without a job, with little money, and without prospects for a future," according to one biographer. In spite of this bleak outlook, on 20 November 1895, Hay married Elizabeth Underwood (1878-1918), daughter of George P. Underwood (1846-1896) and his wife Martha Elizabeth Helms (1857-1926). The next year, they moved to Atlanta where their first child, Gertrude, was born in July 1897. 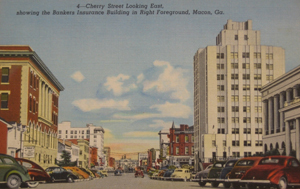 Unfortunately, his job prospects were apparently no better in Atlanta and, later that year, the Hays moved to Macon where he went to work as a manager for the Welch Loan Company. 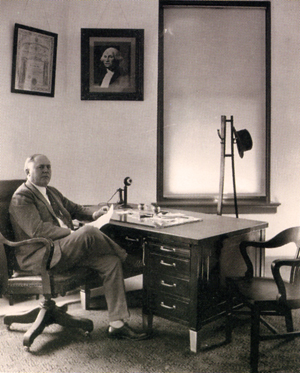 By 1900, Hay was working as manager for the Central City Loan Co. and by 1903 was the company's president. Figure 2. 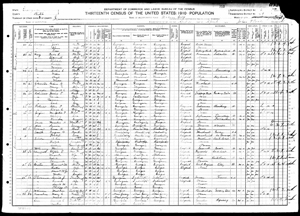 Federal Census schedule, 1910, showing Parks Hay, his first wife Elizabeth, and their oldest children. At the same time, the family had settled in "a small cottage" on Arch Street between Second and Third where two more children, Lucile and Vivian, were born. In 1910, they built a new house at the corner of North Avenue and Laurel in the North Highlands section of Macon, which had begun developing after construction of the first Spring Street bridge in 1895. This was their home for the next sixteen years and it was there that their last two children, P.L. Jr. and Elizabeth, were born. Mr. Hay was also active in civic affairs. 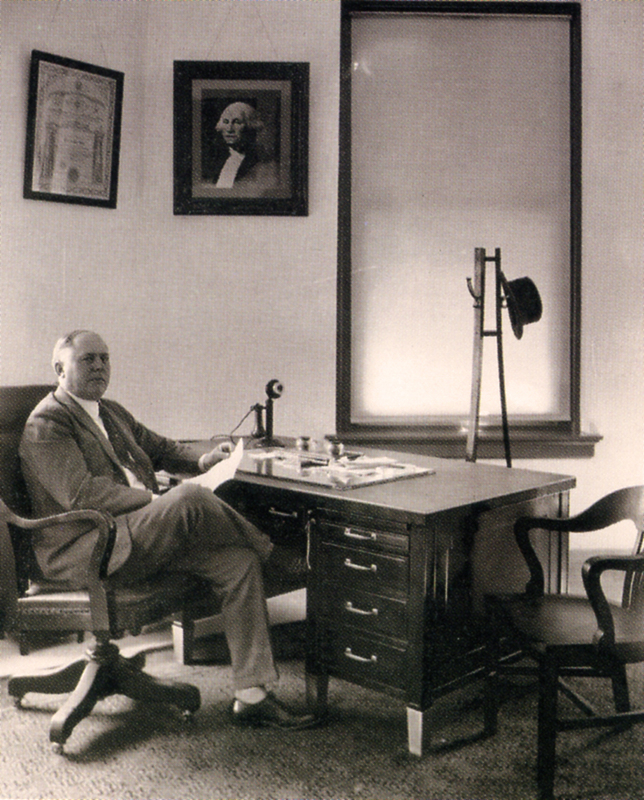 He served as an alderman on Macon's city council from 1912 to 1916 during which time he was chairman of the committee responsible for the city's first road-paving program and was on the committee responsible for construction of the Macon baseball stadium in 1929. He was a director of the Macon Grand Opera Association when it was formed in 1927 and president when it was revived in 1949. He was also a member of the Macon Kiwanis, the Scottish Rite Masons, and the Shriners. On 20 May 1918, Elizabeth Underwood Hay died in the middle of the great pandemic of Spanish influenza and was buried at Riverside Cemetery in Macon. 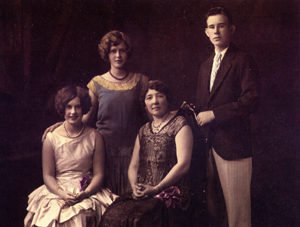 In April 1919, P. L. Hay married Maude Saxon Murphy, daughter of Robert Bankey, a farmer in Randolph County, Georgia, and his wife Tyree Antoinette Saxon. Maude was the widow of Daniel Douglas Murphy, a tie contractor with the railroads in Alabama in the years before World War I. It is not clear if Murphy died or the couple divorced, but this Mrs. Hay, whose portrait hangs in the Johnston-Felton-Hay House reception room, had been educated at Andrew College and was quite active in patriotic and genealogical organizations, including the Magna Carta Dames, Daughters of the American Revolution, and the Daughters of 1812. After her marriage to Hay, she also served on the Macon Park Commission and was active with the Red Cross and the YWCA. Both Mr. and Mrs. Hay were devout Christian Scientists, Mr. Hay having joined that denomination in 1912. According to some accounts, the church was "the central factor in his life and thinking.” In 1920, he served as chairman of the building committee for a new church building and served as chairman of the board of directors of the church for many years. When the Johnston-Felton House came up for sale in December 1926, Hay apparently was not even in the market for a house but was approached by a personal friend who was a real estate agent. After a tour of the house, he made one of Macon's largest residential real estate transactions at the time, according to one account, on the sidewalk in front of the Hays' North Avenue home. According to his daughters, P. L. Hay's purchase of the Johnston-Felton House in 1926 came as a "complete surprise" to Mrs. Hay. The house, besides being several times as large as the North Avenue house, had probably not had much done to it since before World War I as both Judge and Mrs. Felton were ill for some years before they died. In addition, fashions in housing had changed quite dramatically by the 1920s and the faded splendor of the house was seen as "so Victorian ...rather dark and dirty," and in dire need of modernization. Thus, the Hays immediately began a major renovation of the house and grounds. Several significant changes were made to the house by the Hays. The electrical system was completely rehabilitated. The old oil-fired furnace was replaced by a gas-fired furnace, although it still heated only the first floor rooms and the second floor hall. Gas space heaters were installed in place of coal grates in the four main bedrooms on the second floor and in some of the first floor rooms. The coal lift, no longer needed, was replaced by an Otis domestic elevator in 1929. The plumbing was significantly altered as well. In what had been a closet off the stair hall, the Hays installed a half bathroom. On the second floor, the children's bath was remodeled to include a shower and, in the guest bedroom, the Felton-era console sink was replaced by built-in chests-of-drawers and a new wall-hung sink installed inside the bathroom. Other alterations included replacement of the old kitchen in the basement with a new kitchen in the old butler's pantry off the dining room. Presumably then, too, the original hot water system was removed from the old basement kitchen and replaced by a modern water heater, although this may have occurred earlier. 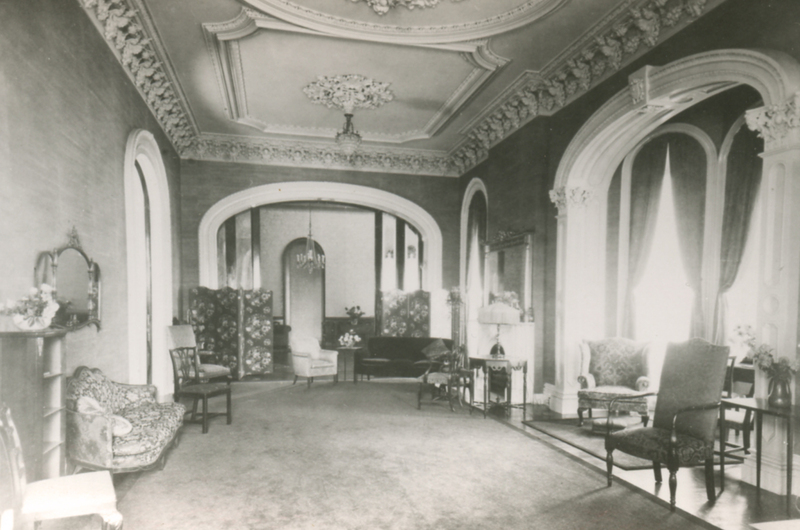 No precise dates have been established for these changes to the infrastructure of the house, but it is probable that many, if not most, of them were made in 1927 along with the well­documented interior redecoration. Mrs. Hay kept thorough records of her purchases for the house throughout her, including not only invoices from decorators and antique stores but her own hand-written notebook of purchases. These documents and the two inventories (1949 and 1957) done during the Hays' lifetime provide a great deal of information on the furnishings and decoration of the house from 1927 through the 1950s. 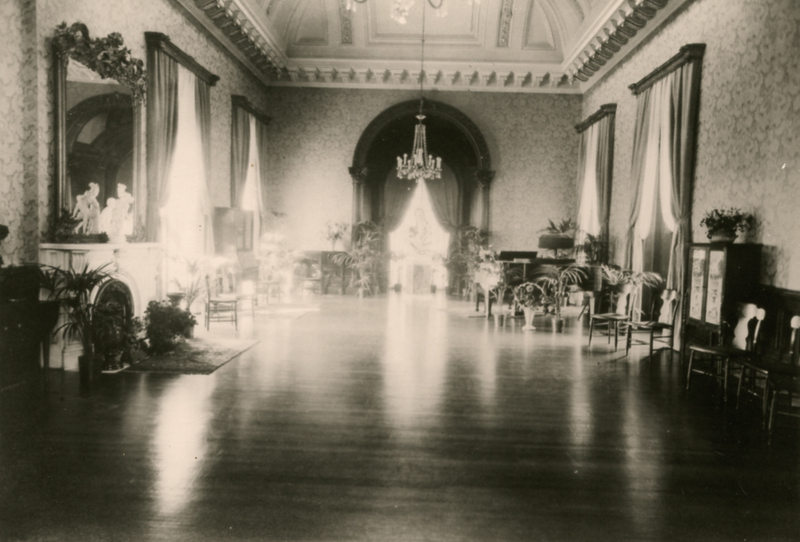 In January 1927, the Hays contracted with Lindsay Morgan Co. of Savannah to redecorate the house, at a cost of over $24,000. The interior was repainted; new drapery, curtains, portieres, and valances were hung; new light fixtures were installed in all of the main floor rooms; and many of the rooms were almost completely refurnished. By the end of April, the work appears to have been completed. Mrs. Hay was an avid gardener and, according to her daughters, "always had fresh flowers." She installed a greenhouse at the back of the basement kitchen and always took a great interest in the grounds. So, in 1927, the Hays also hired J.L. Hoffman, a landscape architect, to redesign the grounds of the house. Three sheets of plans and details survive from Hoffman's plan, although the key to the plantings has been lost. Parts of the Hoffman plan were clearly not implemented as drawn and there were numerous changes over the years to the landscape that actually emerged out of this plan, but much of the Hay's 1927 landscape design remains intact today. The most significant feature that survives was completed by 1930, the lower garden with its pool and fountain and gracefully curving walks. The circular front drive, which followed the lines of Felton's old front walk, also dates from this period, although the entrance pillars were not constructed until the 1940s. In addition, many of the existing shrubs on the property were planted at this time. In 1939, a fire broke out in the old summer living room in the basement. Smoke damage from that fire occasioned an extensive redecoration, including repainting, of the house. Charles Townsend of W.E. Browne & Co. in Atlanta was engaged to do this work. All the wood floors in the basement, except in the old summer dining room, were replaced with poured concrete when termite damage was discovered. 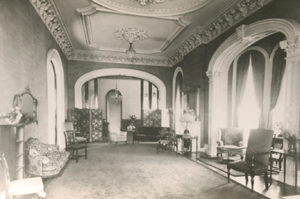 After World War II, Mrs. Hay continued to make significant purchases for the house and to gradually redecorate the rooms that had been redone in 1939. 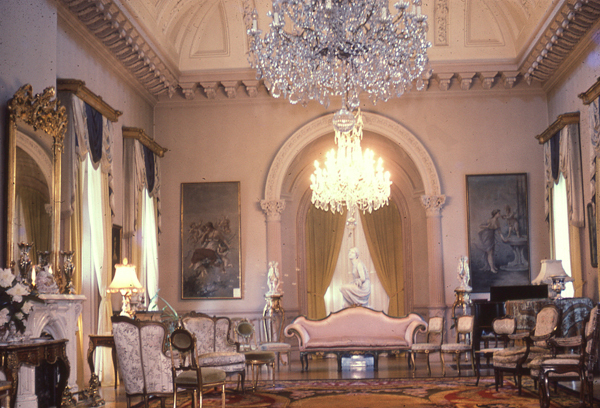 Several of the paintings in the house, including Le Febre's "Bride of Sorrento," Swift's "View on the River Hull," and Wichelo's "Cathedral;" objects such as the Sevres platters in the Dining Room and the Music Room chandeliers: and numerous pieces of furniture that remain in the house were purchased after 1945. P. L. Hay retired as president of Bankers Health in 1954 but remained Chairman of the Board and active in the company until his death on 20 August 1957. Following his death, Mrs. Hay's sister Tennyson Birdsong lived at the house with her until Mrs. Hay's death on 26 September 1962. Both Mr. and Mrs. Hay are buried at Riverside Cemetery. Following Mrs. Hay's death, the fate of the house was called into question. Wishing it to be preserved at a time when many large houses were being razed or adapted for commercial use, the family, in the words of a daughter, "tossed around" for a solution to the dilemma. In 1964, with encouragement from the Macon Chamber of Commerce, the Hay family began opening the house to the public as a museum. With tours given by the Hays' long-time butler, Chester Davis, the house quickly became a popular tourist attraction. In 1971 the house was listed on the National Register of Historic Places with the statement in the nomination that it "is without question the finest, most elaborate residence in Macon, and one of the more outstanding in the United States." The measure of the house's national significance was again taken in 1974 when it was designated a National Historic Landmark. The burden to the family of the upkeep on the property was considerable, however, and, by the mid-1970s, it had become increasingly clear that the existing arrangement was not enough to insure the long-term preservation of the house. Consequently, in 1977 the decision was made by the family to convey the house with a small endowment to the Georgia Trust for Historic Preservation, Inc.
1. George D. W. Burt, "Builders of Middle Georgia—#7, Parks Lee Hay," Macon Telegraph and News, May 5, 1935. 2. Atlanta City Directories, 1895-98. Macon City Directories, 1895-98. 3. Burt, Macon Telegraph and News, 5 May 1935. Macon City Directories,1897-1910. 4. According to his daughters, P.L. Hay and two of his young friends left Dallas, Georgia, for Atlanta in the 1890s. Eventually all three formed large insurance companies. One of these friends was I.M. Sheffield, who founded Life of Georgia. The other friend, Charles Drake, went to Indianapolis and founded one of that state's largest insurance companies. 5. Fran LaFarge, "Parks Lee Hay," Dictionary of Georgia Biography, pp. 422-423. 6. Winifred Scott Downs, ed., "Maude Saxon Murphy Hay," Encyclopedia of Biography (New York, 1960), pp. 327-329. 7. American Life Convention, memorial resolution adopted October 9, 1957. 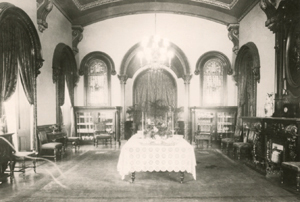 Johnston-Hay House Coll. 8. Burt, Telegraph and News, 5 May 1935. 9. Mrs. Joseph Curtis and Mrs. Halstead Anderson, interview by Maryel Battin, tape recording, Macon, 26 January 1981.